The best ICVerify replacement for business to business, including manufacturers and distributors, is CenPOS. If yours just stopped working, you need to replace it now to comply with mandatory Payment Card Industry Data Security Standards (PCI compliance). This article outlines the steps to get started with a new web-based solution. Don’t be afraid of changing credit card technology. It’s going to be easy. Both you and your customers will benefit. Merchant fees will be lower. ICVerify is incapable of sending the data needed to qualify for the best rates. If fraud is a concern, you’ll have greater protection with newer cardholder authentication tools. Process transactions from all platforms, including laptops, PCs, smartphones and tablets with an internet connection. Communicate the way your customers want – text or email. Text messages are sent from a regular landline, never individual mobile devices. Contact for consultation on the best way capture the cardholder data from your customers. Because we deal with this over and over again, in less than 5 minutes we can assess the situation and make the best recommendation. Keep your merchant account or change? 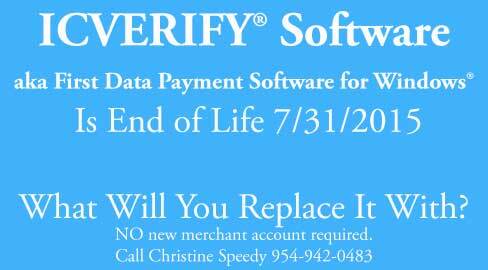 If you’re using ICVerify, you’ve probably had your merchant account for a long time. The credit card processing world has gotten more competitive over the years so expect lower merchant discount rates. If you’d like a review to see if alternative might be better and or cheaper, provide three consecutive merchant statements. Three are needed for underwriting, so it saves time later if you decide to change. Once the initial decision above has been made, you’ll be provided the appropriate month to month payment gateway agreement. Depending on the recommended solution, you’ll be ready to go within 1 to 5 business days. Whatever you need, we can probably do it in the time required. Do not wait. Acquirers are actively identifying the systems merchants are using to submit transactions, and when they find out you’re still using ICVerify, it will be shut down immediately and you will not be able to process transactions. It’s not PCI Compliant and they will not risk their compliance for you. Ready to get started with CenPOS? Call Christine Speedy right now at 954-942-0483, 9-5 ET for a consultation. Sometimes available other hours and Saturdays so if you’re west coast, no worries, call any time! CenPOS is a merchant-centric, end-to-end payments engine that drives enterprise-class solutions for businesses, saving them time and money, while improving their customer engagement. CenPOS secure, cloud-based solution optimizes acceptance for all payment types across multiple channels without disrupting the merchant’s banking relationships. Need to replace ICVerify Software? It’s still in use in 2018, even though it was end of life back in 2015. This means any company using is not PCI Compliant and likely has a non-PCI compliance fee of $19.95 per month on their monthly merchant statements. Alternatives are abundant for card not present and retail credit card processing, but none are comparable to CenPOS for meeting business to business (B2B) companies. authorize.net and others may be suitable options for other business types; Call 954-942-0483 9-5 ET for a consultation. You will get zero support. If you cannot open due malfunction, you’ll have no access to records. If you’re acquirer shuts down your ability to send transaction data, and this is happening frequently because it’s not PCI Compliant, they will not turn it back on. If your acquirer finds out you’re using ICVerify in 2018, you will get shut down. It’s imperative to migrate to new solution as soon as possible. A cloud payment gateway is required. There’s no software to install. You can use a payment gateway via integrated or non-integrated options, which include mobile app and virtual terminal via secure web site. ICVERIFY was a buy once and use forever product. Payment gateways have per transaction fees. Many businesses make the mistake of using the one with the cheapest fee or the one that their developer or consultant is familiar with because they’ve used it for a decade or more. Are you using the same cell phone you did 10 years ago? The cheapest fee could result in the highest actual credit card processing interchange rate qualifications or inefficiency. For example, most gateways do nothing to help merchants reauthorize after an authorization expires. That matters because even though the issuer usually approves the transaction for up to 30 days, it won’t qualify for the best rate, which could be half the cost of the non-qualified rate. Comply with 2017 and 2018 Visa stored credential framework and mandate deadlines. It’s complicated. CenPOS automates compliance with things like sending the merchant initiated or customer initiated use of stored credential flag. What if ours is not a B2B company? Call for a consultation. We offer multiple payment gateway options. 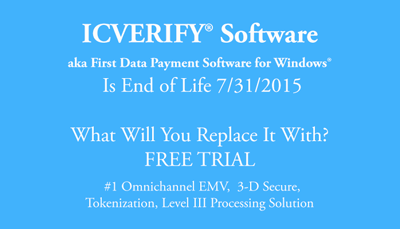 Replacing ICVerify or other legacy software for batch credit card processing? Whether you’re in the cloud, or headed there, methods of payment processing have changed to meet current and future requirements for PCI Compliance and fraud prevention. For service providers, including non-profit mail processing, payment gateway selection impacts efficiency, merchant fees, and even client PCI Compliance burden. Click Upload New Transaction File. Locate from your system the file that you want to upload. Click View Status of Uploaded Transaction Files. Select the desired uploaded transaction file from the Select Upload File drop-down list. CenPOS increases efficiency to upload and retrieve responses, reduces friction with no login required, and also supports multi-merchant login, enabling users to toggle between accounts, creating efficiency for both the service provider and the merchant. Merchant fees are impacted when a transaction does not qualify at the lowest interchange rate possible. For example, business to business companies must submit level III data to qualify for related rates, which are often 90 basis points (0.90%) lower than without. The payment gateway must be certified for level III to each acquirer supported. Only a few payment gateways are level III certified, and even fewer of those offer an acceptable batch upload solution. PCI Compliance burden is reduced with tokenization, outsourced payment processing, reduced vendors and reporting. The latter is critically important for forensic audits, as well as financial. The average gateway only saves data for two years, and has limited data retrieval capabilities. CenPOS audit reports cover every touch to the platform- who, what, when, and more, with records available for a minimum of 7 years to match IRS requirements, reducing the cost of on-site and remote audits. To learn more about batch credit card processing, replacing ICVerify, and cloud payment differentiators, Contact Christine Speedy for a free consultation for all your omnichannel global payment needs.